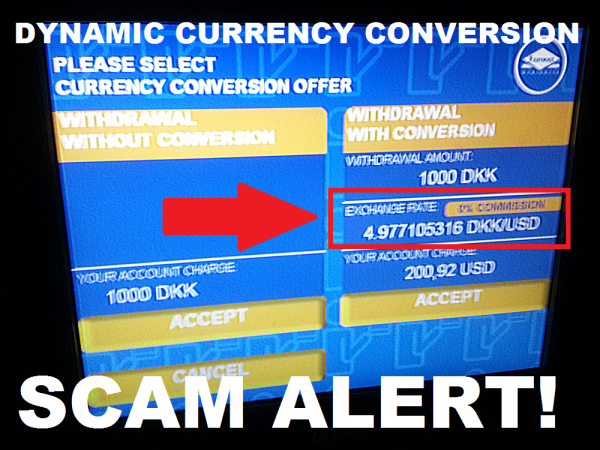 The Dynamic Currency Conversion scam is alive and well and spreading like a fire across Europe. Most of the hotels in Netherlands were very eager to offer me the ability to pay on the currency of the card used and not in Euros. The ATM scam at the Copenhagen airport is even more disgusting, however. When you try to withdraw cash, you are presented with the screen above (sorry for the quality, as it was taken on a cell phone). The ATM presents a currency conversion rate from DKK to USD and advertises it as “0% COMMISSION” that is an outright lie. After you choose the option that you prefer being charged the DKK, another screen pops up to make sure that I don’t want to switch to being charged in USD. Can you guess how much the rate is actually off? What posted to my MasterCard for this transaction was $187.89. I saved close to $13 by not taking advantage of the “convenience” of having the currency conversion done by this ATM, but rather relied on MasterCard itself. When the hotels try to rip you off on their Dynamic Currency Conversion, the rate is usually off by 3% to 4% and sometimes the information about the spread is actually printed on the receipt. This ATM at the Copenhagen airport has so far been the most blatant example how some of these institutions are trying to rip off their customers. They advertise that there is ZERO commission but forget to note that the exchange rate used is off by close to 7%. Just a reminder that you should ALWAYS decline the option to pay in the currency of the country where your card was issued (if traveling outside of the same currency area) and insist that you get charged in the local currency.